How ’bout for the pancreas? Just kidding. I just realized with Sylvia on Monday and the quinoa biz yesterday and now THIS? All these mofo grainz, boyyyyy. By the time Friday gets here though I’ll have to call it “OPPOSITE OF GRAIN WEEK FOR THE SOUL” becauuuuuuse you’ll see. It’s not a grain. Yet it’s yums for the soul. And desserty. And creamy. And has the word pud in it. Sort of. Never mind. What I’m trying to tell you is, I made something vegan again! But first, let’s have a quick chat about this here grains situation and why my title actually says “With Grains.” Isn’t it so kerplunky? WITH GRAINS, BLAH. I had no idea what to do here, because, you see, the bag of grains that I chose was from Trader Joe’s, one of those mixed bags that has everything in it, a mix, of everything, quinoa, Israeli couscous, orzo, baby garbanzo beans, all dried up and ready to boil, and I love commas, and then you cook it, and it’s ready, just like that, to mix with whatever else you make, to eat, and I should stop this sentence right now, but I’m in a trance, a comma trance, a grain trance, and can’t snap out of it. The message here in all of this is, it’s up to you. The paths you take in life, the decisions you choose. You have the power. The GRAIN POWER. Choose wisely, grasshopper. Or you know, don’t. Whatever. Can I just tell you though that the chickpeas and cauliflower are all roasted up nicely with curry powder and some fresh thyme? 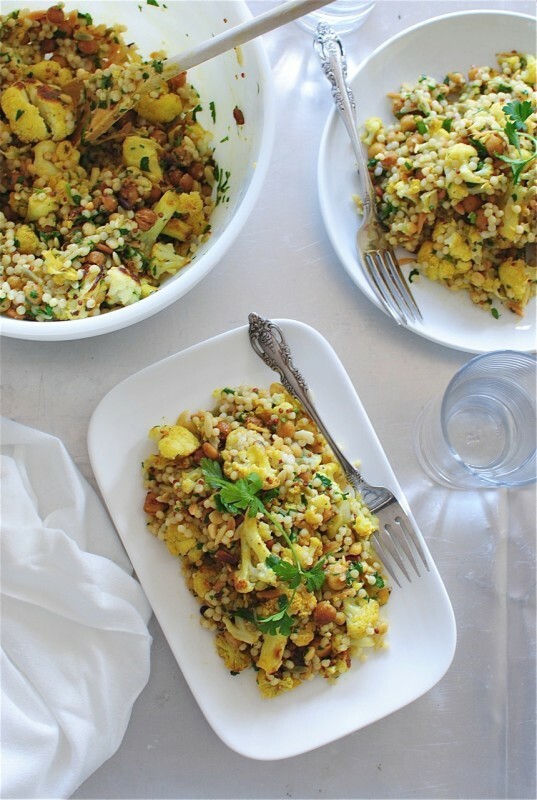 And then gently tossed with the cooked grains, a bunk ton of fresh parsley, lemon juice and toasted pine nuts? Can I tell you this? Because I’m gonna. 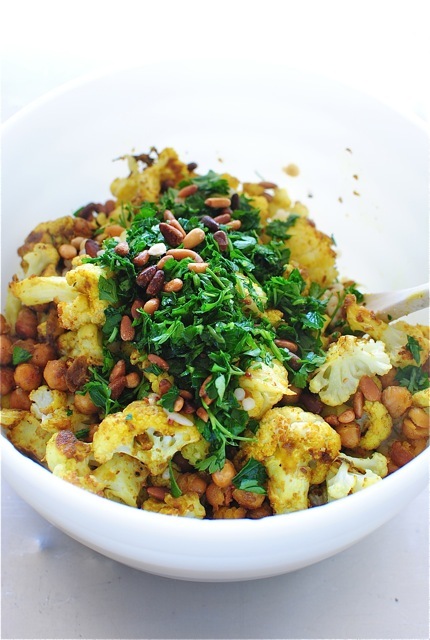 The chickpeas and cauliflower are all roasted up nic – I’m just kidding. Eat this as a side dish, or from a trough. You have the power. In the meantime, bring a small pot of water to a boil. Add the grains and cook until tender. How long will depend on what you choose. I had a Trader Joe’s bag of mixed grains that was pawfect. 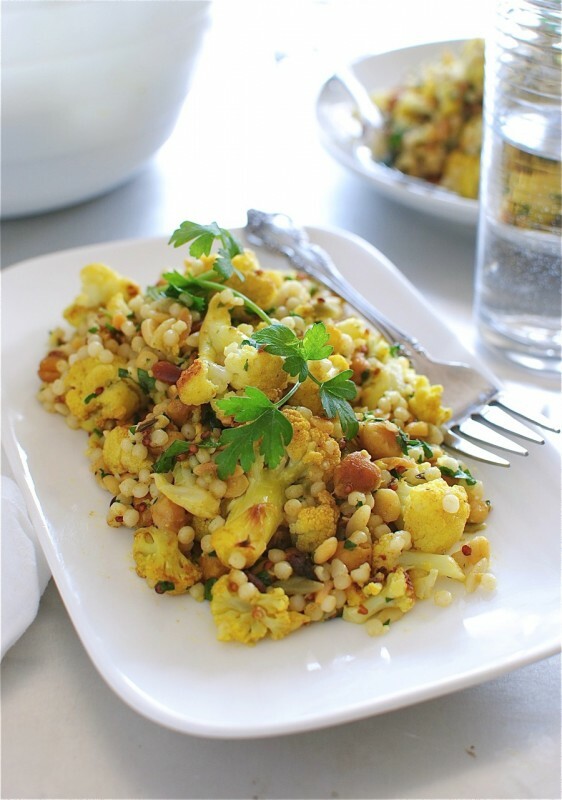 In a large bowl, combine the cooked grains with the roasted goodies, the parsley, lemon juice and pine nuts. Give it all a good toss. Taste it. Might need another pinch of salt? Ger fer ert. 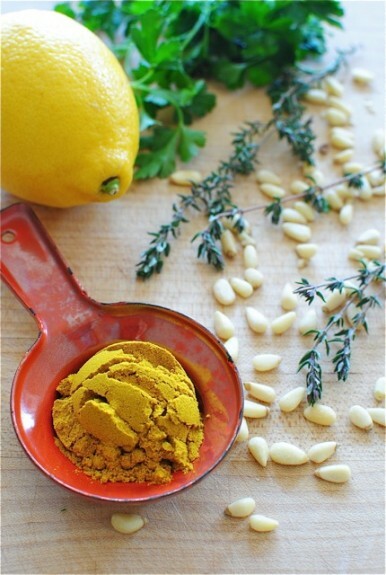 Serve with more fresh lemon wedges. omg. I’m so going to make us Grain Power t-shirts. 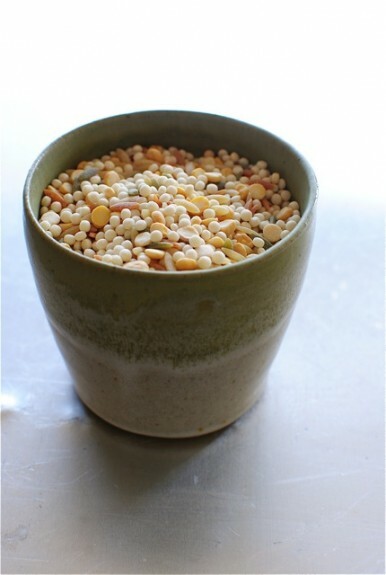 Israeli couscous is my all time favourite grain! Love the chewiness - and would be fantastic with this cauliflower curry. Can't wait to whip up a big batch this weekend! 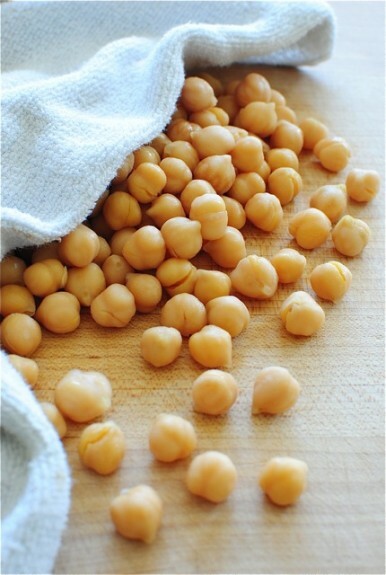 I love those little chick peas!! they look so cozy under that little towel! you made dessert again!??? I can't wait to see it! This salad/grain/dish looks delicious. 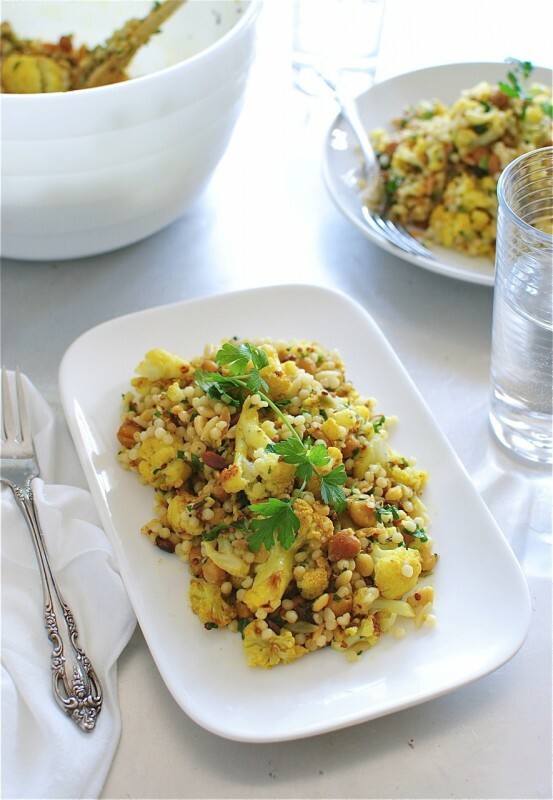 I love curried cauliflower. In fact I may make this for dinner. You just made my day with this! Israeli couscous is the BEST! Count me in!! I'll take all the beautiful bowls of this for myself! Wholesome and gorgeous. Love it! Keep these grains coming. I'll just go ahead and eat this whole bowl! Gorgeous. I want to live inside that bowl. 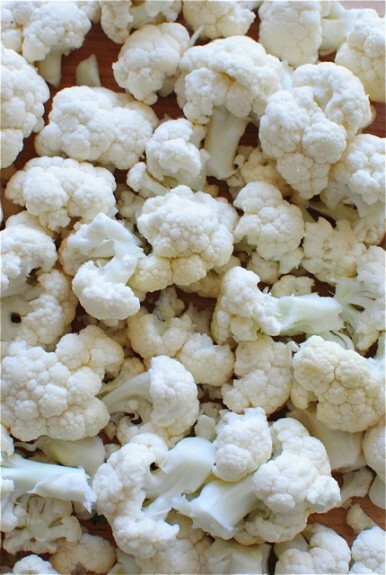 I had cauliflower stir-fry last night. It was delish! The curry would be such an addition! Absolutely gorgeous Bev! The colors... the flavors... the goodness! THIS is so happening in my life and SOON! 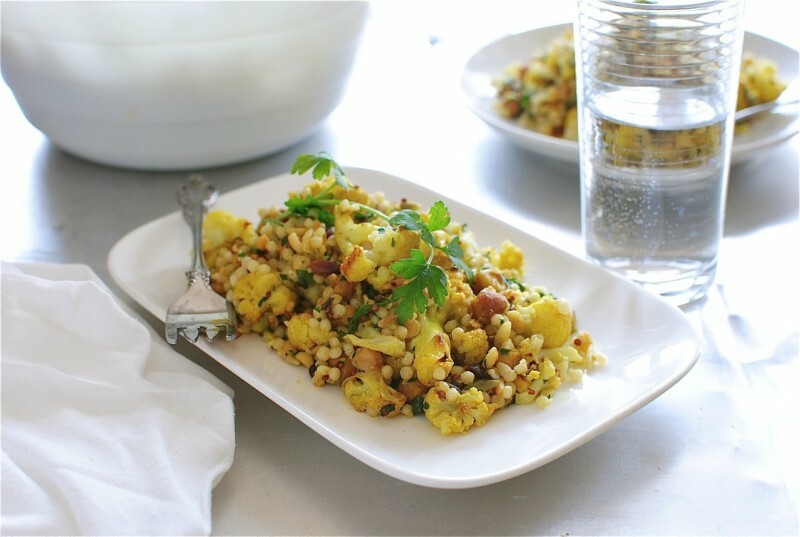 I love roasted cauliflower, this looks so good! I just made this recipe and its AMAZING!! Its wholesome, filling, and so tasty!! I've been obsessed with cauliflower recently. So yum! Damn, I've bought that grain blend several times before.....but it never looked this good! 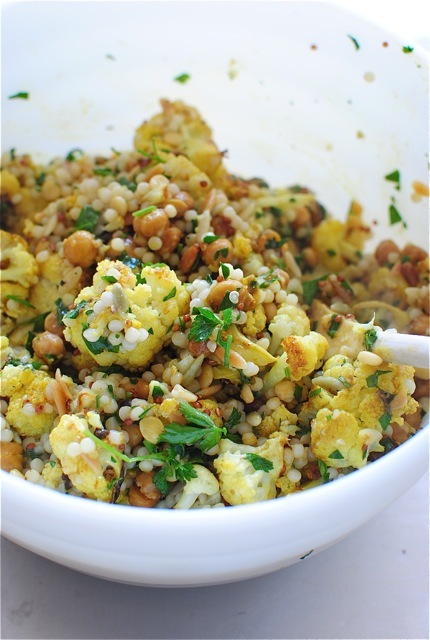 Cauliflower & chick peas...you've reeled me in! This looks so delicious and satisfying as well. THIS IS AMAZING. FOR REAL. Made it for dinner and served it with some butternut squash soup and the whole family LOVED it! Thank you for such a tasty, easy, healthful recipe! This was wonderful- thanks for another great recipe! This was so tasty! I'm going to keep putting it on the week's menu for at least a couple months. 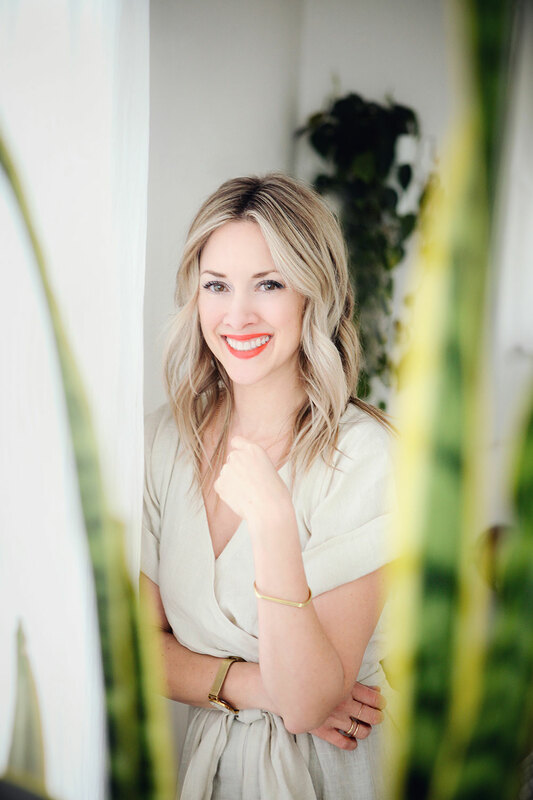 I have to tell you that three quarters of my weekly menu comes from your blog! I love all your recipes! Can you serve at room temp? Thinking of a dish for a large catered event. This was totally delicious. Thanks for such a great recipe (delivered with humor and fun)! Glad I discovered your site.